Oregon looks like a clear favorite over Ohio State in the college football championship game. The markets opened with Oregon as a 7 point favorite, which implies a 70 percent win probability. The predicted margin of victory is even higher with my team rankings based on margin of victory at The Power Rank. That's really good! Right? Meanwhile, Ohio State barely made the college football playoff after an early loss to Virginia Tech, a team that went 3-5 in the ACC. They're playing a third string quarterback lucky to have receivers talented enough to catch his jump balls. It all adds up to a convincing advantage for Oregon. But let me explain why, in reality, Ohio State is a terrible match-up for the Ducks. Ohio State has an elite ground game. To quantify this, let's look the basic efficiency statistic: yards per carry. In college football, sacks count as rushes in the official statistics. Since sacks are pass plays, I exclude these plays in calculating yards per carry. This visual shows the difficult match-up for Oregon. The blue dots represent Ohio State's pass and rush offense. The smaller green dots show Oregon's defense, and better defenses appear further to the right to facilitate comparisons. You're looking at how a unit compares to average. The gap between Ohio State's rush offense and Oregon's rush defense shows the clear advantage for the Buckeyes. They will give most of the carries to Ezekiel Elliott, who has gained 6.9 yards per carry this season. We all saw his speed when he outran the Alabama defense for a 85 yard touchdown in the semi-final game. Quarterback Cardale Jones will also run the ball, and he's a load to bring down at 6-foot-5, 250 pounds. Offensive line coach Ed Warriner deserves much of the credit for Ohio State's explosive run game. He had to groom four new starters this year, and none of the candidates had 5 star recruiting credentials. While the offensive line came into the season with question marks, it now looks like the strength that could carry them past Oregon. 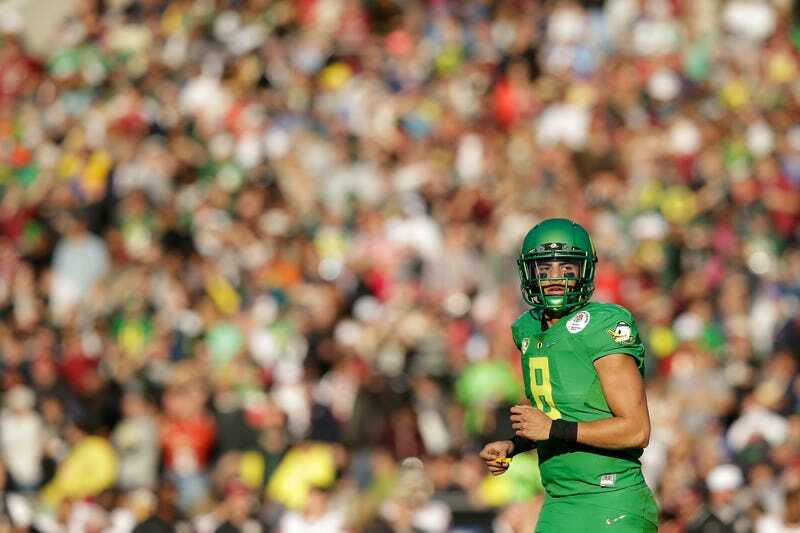 Oregon, led by Heisman winning quarterback Marcus Mariota, excels at throwing the ball. To quantify this, let's look at yards per pass attempt, tweaked to include sacks. After adjusting for schedule, Oregon has the top ranked pass offense. They are predicted to throw for 9.04 yards per attempt against an FBS average pass defense. However, Ohio State's strength on defense is against the pass. They had the 9th best pass defense by adjusted yards per attempt. Against Alabama, they didn't allow star receiver Amari Cooper to make big plays. While Cooper averaged 13.9 yards per catch this season, his longest against Ohio State was 15 yards. The visual shows how Oregon's offense matches up with Ohio State's defense. The gap between Oregon's offense and Ohio State's defense shows the size of the advantage. Oregon should still be able to throw the ball against Ohio State. However, it won't be as easy as against Florida State. The visual also shows Oregon's edge in running the ball. They should run it often (and they did on 55.9 percent of plays this season) and set up play action for Mariota. For college and pro football this season, I started aggregating many predictions into one ensemble prediction. This ensemble, which includes my adjusted numbers and data from the markets, predicts Oregon by 3.2 points, which corresponds to a 59.5 percent win probability. However, you should never blindly trust numbers, especially in a game with mismatches. One of the predictors in the ensemble accounts for passing and rushing separately for each team. It considers Ohio State's significant edge in running the ball and that Ohio State runs the ball on 59.3 percent of plays. This match-up model predicts a 50-50 game between Ohio State and Oregon. This game most likely comes down to a field goal in the final minutes. I give a slight edge to Oregon to win, but don't be surprised if Ohio State pulls it out. Ed Feng has a Ph.D. in Chemical Engineering from Stanford and runs the sports analytics site The Power Rank.